One of the limitations of a blog is that it doesn't have an index or sitemap of the site to make it easier for readers to find the content that they are searching for. While the blog archive and labels have all the information about the published post, these do not appear on a single page completely, so searching for more posts is not always easy. Luckily, this gadget will help you to add a table of contents or sitemap on Blogger showing the index of all posts separated by categories that have been published. It will also show the latest posts with a text saying New! Demo: You can see it in action by clicking here. Step 2. Go to "Pages" > click the "New Page" button. 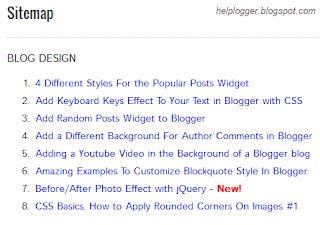 After adding the above code, replace http://helplogger.blogspot.com with the address of your blog. Step 4. Click "Options" on the right side of the post editor and select "Don't allow, hide existing" for the Reader comments. Step 5. Finally, click the "Publish" button and see the page. That's it! The index of the posts is sorted alphabetically and is updated automatically each time a new post is published. Table of contents are the good way to navigate visitors through a single page to their required post. Good work, keep sharing. I tried everything and its always blank even with new posts? How can i add a category ?? And a search at the top-I get amazing #'s of page views that way. Wow, what a smart and cool feature! Thank you, using it now as well! not wroking on my site, shows nothing, what to do?? first, it works, but not at all later, i don't know why ? This works.. but i realized if you use many labels in a post it will also listed multiple times in sitemap. Is there other way to limit it? I tried to do this to my blog, but I am getting an empty page instead. When I tried without replacing your page's url (helplogger.blogspot.com), I got your blog's sitemap as the result. Can you help me to fix it? Nice! I love it.. Do I need to show it in the menu o just make it invisible? Only one of the many that I have tried! I've been searching so long to do EXACTELY that. Is there any update please? May be the problem is with your tagging or customized template. Not working for me either :( Is it because I'm using s Dynamic template? Why it does' nt work on my blog ! It as just worked at the beginning and after there is nothing link on the page ? Delete the text that you copied from the original site. Copy it again from original site and paste it back. Make any modification you want and then update one time. If you want to make more modification it will not work you will have to go back delete everything and start again from original source, modify as you wish and update. Updating twice makes it not show. @ Tiger Qasim Make sure that you select the HTML pan/editor not the compose pan and past it inside. I noticed that this sitemap only capture Labels, Please how can I make my posts (and pages) appear just like the sitemap you created here? because is not all the post that i labeled as a result I only see the labels only. Is there anyway to only list selected labels?